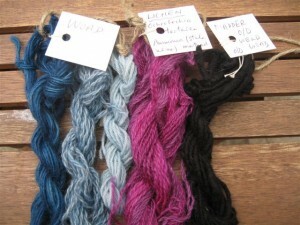 This entry was posted on Tuesday, August 9th, 2011 at 4:21 pm and is filed under Dyeing Tips & Recipes, General Dye Information. You can follow any responses to this entry through the RSS 2.0 feed. Both comments and pings are currently closed. Jenny, you are such a treasure trove of information! I had no idea that lichens were so scarce in the UK. In my little corner of the world, they seem to flourish everywhere. Recently, I viewed a news program about a lichen problem at Mount Rushmore. It seems as though the lichens have taken over and are eroding the underlying granite. The government is funding an ongoing cleaning effort to keep the lichens under control. Perhaps I should make a trip to South Dakota to harvest a bit before they are all scrubbed away. Your colors are beautiful – as always! Sorry for the second post. I forgot to ask this question in the last one. Do you think that the scarcity of lichens gave rise to the association of the color purple with royalty? If purple-colored yarns and threads were so rare, then perhaps only the wealthiest members of a society would be able to possess them? Just curious. I think the association of the colour purple with royalty arose from the use of Tyrian or Imperial purple, which came from shellfish, rather than from any connection with lichen purple. The purple dye from shellfish was used to dye the clothing of Roman emperors & this colour was reserved for such high-ranking individuals. I believe that lichen purple was sometimes used together with Tyrian purple, to eke out the precious shellfish dye. I did a fair amount of background reading for this, and found that orchil purple was sometimes used as part of formulas either to imitate or to "stretch" supplies of Tyrian purple. 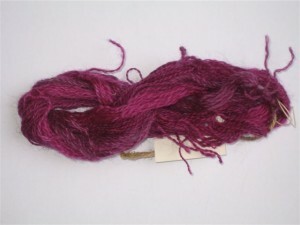 Orchil does produce lovely shades — including a brilliant hot pink! — and it's too bad it's not more colorfast. Thanks for this link, Chris. I have also read that lichen purple was sometimes used to “stretch” the precious Tyrian purple. I have a question – when you say "well-fitting lid" on your jar, do you mean sealed or allowing some small amount of air to get in? If you open the jar to stir it, obviously air can get in but not necessarily if you just shake it daily. I know it can make a huge difference! The well-fitting lid keeps the odour enclosed & prevents fumes from escaping. But I do not completely seal the jar, which will probably contain some air – & therefore oxygen – anyway if it’s not filled right up to the top. Some dyers stir the mixture regularly but I have always just shaken it at regular intervals – every day or so – & found this method to work perfectly well. Other dyers may use different methods but I can only offer my own experiences. I have read that some dye chemists believe the mixture requires the regular introduction of oxygen by opening the jar & stirring but I have not personally found this to be the case. In earlier recipes, such as those recorded in Scotland in the 18th & 19th centuries, the mixture is kept “well stoppered from air”, so earlier dyers did not open the jar & stir to deliberately introduce oxygen. Su Grierson in her book “The Colour Cauldron” has excellent sections on dyeing with lichens & she comments that she has achieved similarly good results using either method. So the choice is up to each dyer.